Oh, how I love Maybe Baby…. who shall now be referred to as Baby Girl here on the blog, since we found out ten days ago that she is a she. Did you see the adorable photo? I love her and have since the birth mom (MH), sent me the very first sonogram photo. Baby Girl was only eight and a half weeks in utero, but she stole my heart. Pretty much immediately. I tried to hold back some, but I simply haven’t been able to do so. The agency director warned me about holding back after our disruption last October. She knew it would be my instinct, but shared with me that doing so would be interpreted as coldness by the birth mom. We had no idea that our birth mom would be someone who would know me so well. Still, from the beginning, MH said to “be Mindy” about this. So, I have. I have dreamed about Baby Girl. I have imagined her. I have prayed for her. Here we are at twenty-two weeks gestation and I can barely wait to hold her. Touch her sweet face. Feel her little breath. About eight weeks ago, I started to picture her as a her and as a her with Down syndrome. I couldn’t shake it. I prayed for peace. And it came. It came in the form of believing, with near certainty, that Maybe Baby was a girl. A girl with Down syndrome. I told MH. I told Paul. I told a few friends. I shared on the blog about how I was scared for a couple of weeks and then I wasn’t. I was a peace. 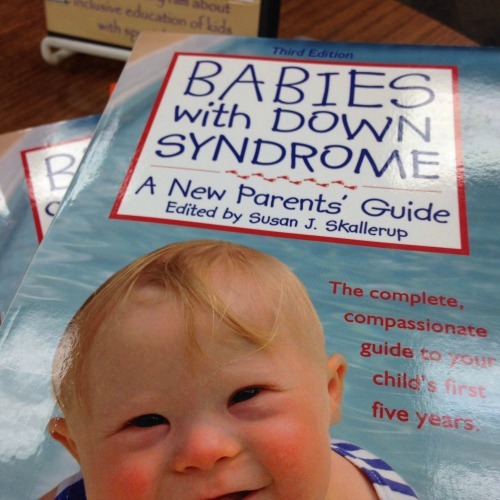 In my dreams, Baby Girl had Down syndrome (and her name already too). And I smiled when I pictured her. Not one bit disappointed or scared or feeling like we would get “less” of a baby because she had Downs. In all of this… this adoption journey…. I have known I could love any baby God gives me. I trust Him and believe Him when He says that all of life is precious. Every baby worth loving. And parenting. My heart and arms are simply waiting. Ten days ago, I sorta looked like a prophet. I’m not, of course. Only God knows the future, the plans of man, and how we are formed in the secret place. Yet, He really did press on my heart about Baby Girl’s design. Ten days ago, the technician and the doctor told us that it looked like Baby Girl has Down syndrome. Yesterday, it was confirmed with blood test results. Our beautiful baby girl has Down syndrome. And she is just as fearfully and wonderfully made as my other children, who do not have Down syndrome. And she is just as fearfully and wonderfully made as your children, who do not have Down syndrome. And she is just a fearfully and wonderfully made as anyone’s children, whether they have Down syndrome or not. 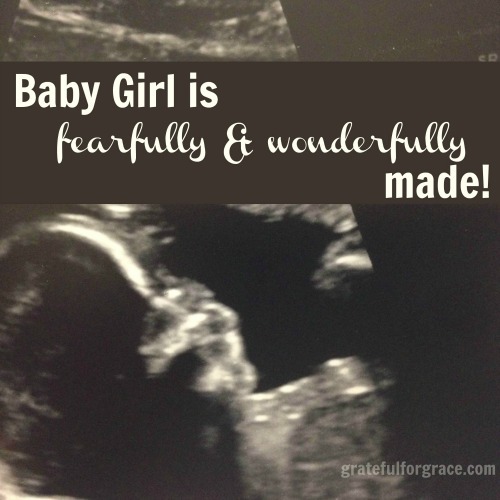 “Fearfully and wonderfully”… God did not make her less. Or flawed. Or imperfect. At least no more so than you or I. She has an extra chromosome and that will affect how we handle her physical care. It won’t affect how we love her. She has an extra chromosome and that will affect how others see her, but only for a bit. It won’t affect how we see her. She has an extra chromosome and that will affect how she learns, moves, and interacts. It won’t affect how we treat her. Please pray for her heart to be healthy. Heart complications are common, but wow, do they scare me. I don’t want to lose her. I want her to be safe. There will be a few new gigs for us and new challenges and difficulties in parenting Baby Girl, but parenting is parenting. We go into it trusting God and obeying His commands. That will not be any different. We will learn what we need to learn. And we will love as we always love. Friends, do not be sad for us. Do not feel badly for us. Do not be disappointed for us. And don’t apologize for or to us. God designed our daughter intentionally. She is no accident. Just as your eye color, your face shape, and your DNA are a part of your God given design, so is her extra chromosome. Of course, some things will be more difficult as parents. But this is not a heartbreaking situation. I could handle negative reactions better if her life was at risk. That would be scary and so sad. It’s not sad that she has Down syndrome. Her life will be spectacular. Just like yours. And mine. She will bless. She will encourage. She will glorify God. She is our Baby Girl and we can’t wait to meet her. She is fearfully and wonderfully made!